Working on pragmatics is difficult. Working on pragmatics with teens is even harder. 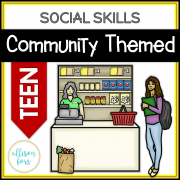 Use this thorough product designed to work on a variety of social skills within the community. These interactive activities will give your students control of the situations and questions presented. 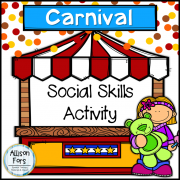 There are 80 social situations included, plus options to include custom-made ones depending on your student's needs. Use these activities individually or in groups. The more complex cards are great for discussions. The activities in this product are organized in order from easiest to hardest. Keep in mind, many of these questions don’t have one right answer. 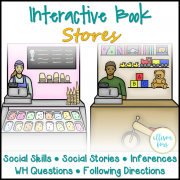 I hope these activities help you work on pragmatics in an interactive and engaging way! Directions: Cut out the cards and place in 2 piles face down – store & situations. Have the student pick one card from each pile, applying the situation to the store and answering. These situations are the most basic and result in a straightforward answer. Includes: Pages discussing “Initiating Conversation”, “Asking & Answering Questions”, “Body Language”, and "Identifying Sarcasm". Directions: Read and discuss the points on each page. Answer the 6 open-ended or multiple choice questions per page. Includes: Map with travel destinations, 6 pages (a page per store) with 4 corresponding scenarios on each page. Directions: Print the pages and staple together on the left hand side where the margin is. When the choices have been made, the students finds the page of the store chosen and finds the appropriate scenario for the choices picked. There are 24 possible options to choose from. These scenarios require more complex social thinking and awareness. Directions: Each page shows a web map starting from the beginning of the experience to the end, with various social situations that arise. The student is asked to find solutions incorporating many pragmatic skills. Start at the beginning of the web diagram, read & answer each situation before moving onto the next box. Works great for group discussions. Includes: Single page with questions about difficult social situations and how to overcome them. Directions: Use as a personal activity or for discussion. Includes: A single page game. You will need to provide 2 dice and place holders. Directions: Included on page. This is the most difficult activity in the packet. It is a generalization activity, and targets thinking of a problem & solution. The purpose is to think about the social scenarios that may arise before you are put a particular situation. Check the preview to see what's included! 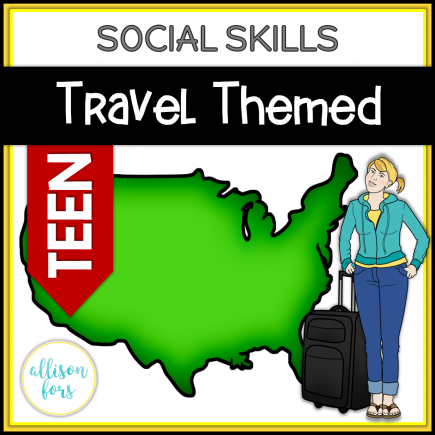 Given a location, situation and choice of conversation starters to choose from related to travel or being on vaction, STUDENT will select one and initiate an on-topic conversation with a peer (teenager/young adult), with 80% accuracy, in 4 out of 5 opportunities, by MONTH, YEAR. 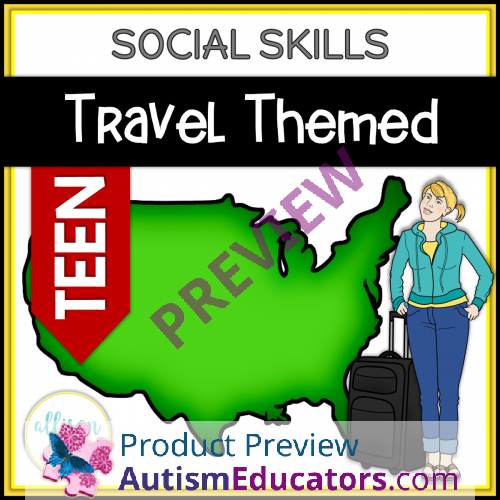 Given a social scenario which may occur during travel or vacation, STUDENT will provide an appropriate response to include a solution in order to resolve a problem (emotional or physical),in 4 out of 5 opportunities, by MONTH, YEAR.